WBCS Main Exam Previous Paper Question pdf available here. Are you looking for WBCS Main Exam 3rd Paper General Study History & Geography previous year question? Then here is the best place for you. You can download all WBCS Main Exam Previous Year question paper. We updated regularly for WBCS Candidates. Also, you can download WBCS Study Materials, WBCS Preliminary previous year question paper. 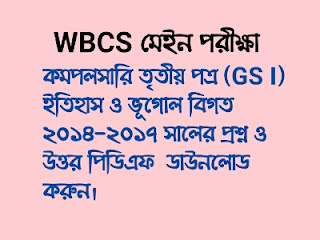 Today GK Solve share WBCS Main 3rd Paper History & Geography Previous Year question paper 2014 to 2017. Previous year question is the most important for you. you can gain some knowledge about particular Examination. So all the WBCS Candidates are requested to download this WBCS Main Exam 3 rd paper History and Geography Previous Year Question. Hope, this post very useful to you.